Have an eclectic family that is full of characters? The Indian Family Sticker will immortalise them into caricature stickers whether they're a bruncher, gym rat, or bathroom singer! Do you do that thing during bumper-to-bumper jams where you look at ‘I am the danger’ or ‘Girls are slow poison’ stickers on the vehicles in front of you and chuckle (while low-key judging)? 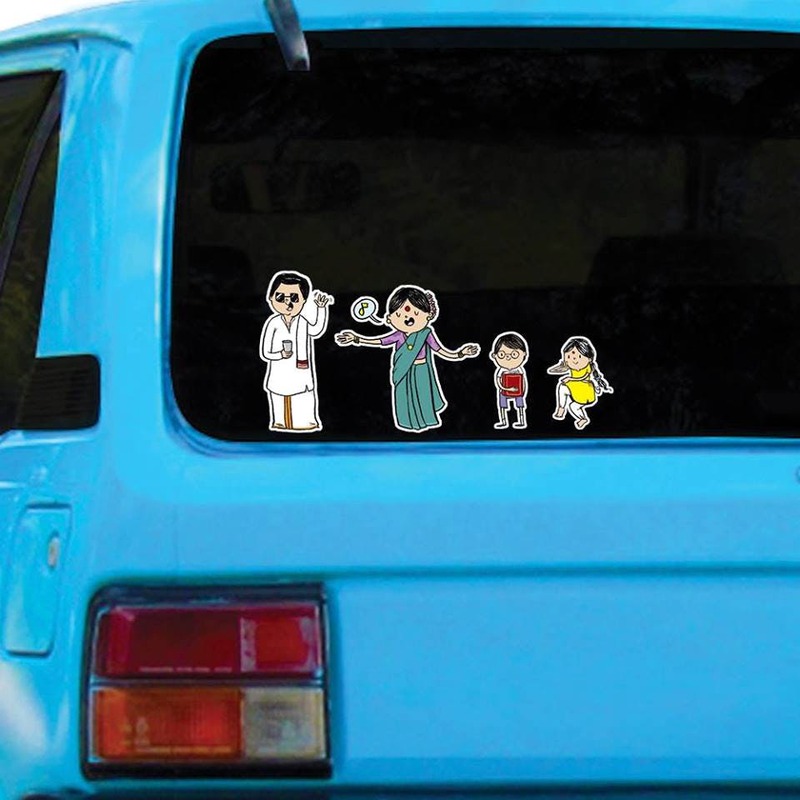 The Indian Family sticker creates, well, exactly what their name suggests for the back of your car with quirky, personalised stickers! Whether you’re looking to entertain the vehicle behind you, or want to proudly display the various members of your large (or small) family, they’ll get it done - sticker form! Available in two designs, as a coloured caricature, or as white stick figures, pick the characters of your family (babies, grandparents, and pets too!) either based on what you do (techie, lawyer, doctor, foodie/bruncher, musician) or where you’re from (Kodava, Gujarati, ‘Indian’ ‘Desi’, Punjabi). They have a range of characters that pretty much captures the essence of whatever type of family you have. Each character costs around INR 99 each depending on size, and what’s cute is that they have sections like “moms/dads” “oldie goldies” and “uniforms” so this is a family that you can choose! The final stickers are measure about 5x3 inches (you can ask them to adjust the sizes as you like, but it might incur an extra charge) which will be printed on a clear vinyl substance and delivered to you anywhere you are across the world! The stickers come with instructions on how to apply them on to your car, or just check out their super helpful YouTube instructions. Should you not find anything you like, or you want something super personlised, you can always contact them for a completely customised sticker set too.